On Sale Now! Save 5% on the Fast Wireless Charger Car Mount Q1 Wireless Car Charger Mount Air Vent Stand Phone Holder for iPhone 8/8 Plus, iPhone X, Nexus 5/6 / 7, Samsung Galaxy S8 S8 Plus S7 Edge S7 S6 Edge Plus Note 5 by Ellishang at All Company Mobiles. MPN: Charging Stations. Hurry! Limited time offer. Offer valid only while supplies last. 【2-in-1 Function】- Combines wireless charger and phone holder in one unit. Wireless charging pad offer a quickly charging while driving. Save you from the tangled locating cords or cables, the process plug cable in and out of device. With the 360°rotatable ball joint enable to hold the phone in a perfect viewing angle while driving. 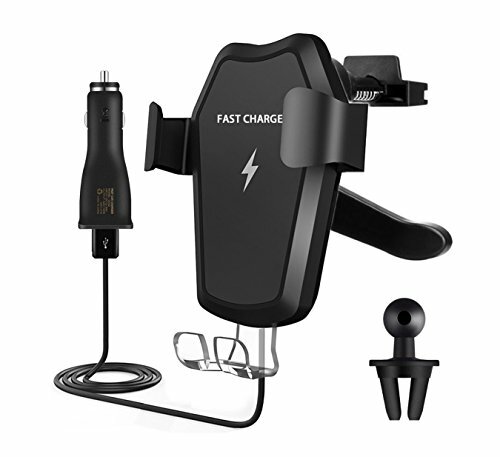 【Fast Wireless Car Charger】-Fast charge modes are ONLY available for Samsung Galaxy S8, S8 Plus, S6 Edge+, S7, S7 Edge, Note 5 and Note 8. Other devices will charge at regular speed. like iphone8/8 Plus, iphoneⅩ, Galaxy S6, Galaxy S6 Edge, Google Nexus 5/4, LG G3, Motorola Droid MAXX/Mini, HTC Droid DNA/8X, Nokia Lumia 920/928, Some devices may require an additional wireless charging receiver (Not Included). 【Dual USB Charging Ports】-Equipped with the latest Qualcomm Quick Charge 3.0 experience 4x faster charging speed. Dual splitter charging port enable you to charge two devices at full speed simultaneously. More effient and save your time and energy.【Safe Charging】- Built-in high quality Qi wireless charging chipset, and the charging area with anti-scratch & anti-slip silicone padding, protect your phone from scratch and falling. 【Note】- It's normal for phone to get warm or even warmer during the charging process, PHONE CASES(Especially much heavy phone case) is suggested to be REMOVED during charging. Meanwhile, with the temperature control built-in, the charger and phone will stop working to protect them from damage by overheating, keep the phone and charging pad cool for few second is suggested. 【Package&Warranty】-You will get:1x In-Car Fast Wireless Charger , 2x Car Air Vent Mount, 1x Type-C Cable, 1 x Dual USB Car Charger, 1x Instruction Manual and we guarantee LIFETIME warranty and 60 days no questions asked return policy.Your purchase is totally RISK-FREE! If you have any questions about this product by Ellishang, contact us by completing and submitting the form below. If you are looking for a specif part number, please include it with your message.